Fit-Ink: Wow, Kara Goucher's Pregnant! Just call me a bit late to the punch on this one, but something inside of me had a feeling that something was up. At Fit-Ink, we're not shy about our love of Kara Goucher--Liz has been lucky enough to meet her and interview her a few times, while I can only follow her races on TV and dream of being as fast as her. And we both sport Phiten necklaces like the one Kara wears when she's racing, in hopes that it'll help with our running recovery, too. Call it intuition but Friday night had me reading random news at KaraGoucher.org. More because I was curious about what she was up to because the last news I recalled was the March cover story of Runner's World. No news there, but what I should have been reading was The New York Times. Because it was Friday's NYT that featured a story about the friendship between Kara Goucher and Paula Radcliffe. But that wasn't the most eye-appealing news; Goucher is pregnant and due in September, which also happens to be the same day Radcliffe is due with her second child, Sept. 29. Wow, congratulations, where have I been? I knew about Radcliffe's pregnancy--definitely stumbled over that this winter--but Goucher? Runner's World's news page had to share that announcement yesterday. Goucher has her baby bump, and if my math is correct, she's on the downswing of her pregnancy. It's probably one announcement that many runners were waiting for--or Kara fans, at least. Last year Goucher was set on putting the running on hold to start a family post-Boston and post-Berlin. But there was a deadline attached: get pregnant by late April so there's plenty of time to prepare for the London 2012 Olympics. Goucher needs to be ready for marathon trials, which are set to be held Jan. 14, 2012, in Houston. Looks like that came true and with plenty of time to spare. And the crazy part is that both Goucher and Radcliffe are still running fiends at five months pregnant. They're training together in Oregon and planning to race the New York Mini 10K race in June. Oops, not race, run for fun. But we all know that their pregnant bodies will only slow them down enough to finish with the rest of the fast pack and not minutes ahead. Goucher's training on the Alter-G treadmill, which allows her to run at a lighter weight than her body weight. Goucher and Radcliffe are working with Oregon Track Club Elite/Portland coach Alberto Salazar. Goucher's ob-gyn Dr. Robin Barrett is also a runner. Radcliffe has advised Goucher having been through this before. Now that the baby's out of the bag, it seems like Goucher is getting back into the media spotlight. And oh how I wish she'd be attending a race that I was running. Goucher will be speaking at the Rock 'n' Roll marathons in San Diego on June 6 and Seattle on June 26. And she'll be heading north to Duluth to speak at Grandma's Marathon on June 19. Wow! I can't wait to follow their 10K run in June and any other news that stems from this latest release. Thanks Runner's World and New York Times for some exciting Sunday reading and links. Check out a few more here and here--Runner's World is all over it today. 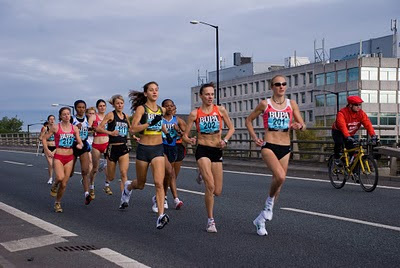 Photo of Kara (left, 203) and Paula (right, 201) running the Great North Run in 2007, grabbed from Connor Lawless at flickr.